Up on Wickham Terrace there are a couple of adjoining buildings that are quite interesting to look at, and they are also quite different functionally to most other Terrace buildings. 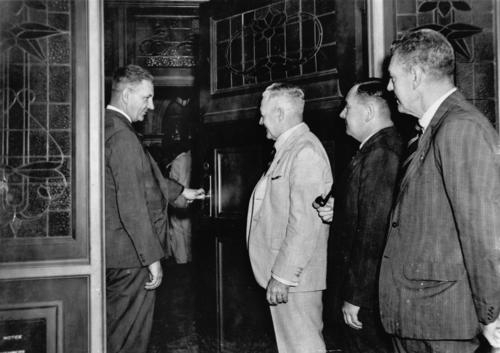 Together they form the United Service Club, and here they are. The top photo above shows a stone and brick building called Montpelier - it was built in 1910 and replaced an earlier building of the same name. The original Montpelier was designed by Benjamin Backhouse around 1864 as a residence, but then became a boarding house. The replacement building was designed by Claude Chambers, built in 1910, and was likely also a boarding house. The bottom photo shows the next-door building known as the Green House. It sits between Montpelier and the Richard Gailey designed Baptist Tabernacle. The Green House was also designed by Claude Chambers and was built from timber and brick around 1907 for Dr TH Morgan, but then it too became a boarding house in this desirable part of Brisbane. 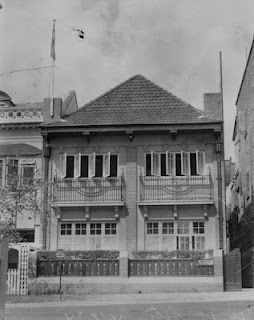 The United Service Club was established in 1892 for officers of the Queensland Defence Force and had operated club rooms in various parts of Brisbane including this one (below) in George St, pictured in 1934. 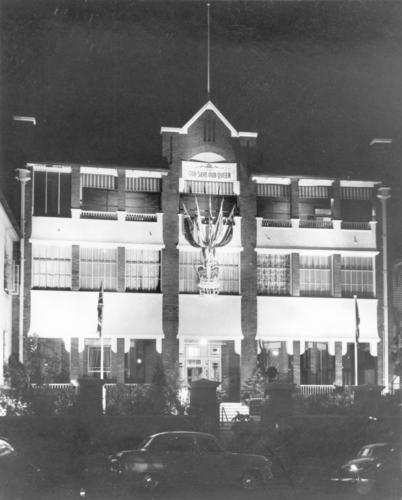 After WWII, Brisbane's United Service Club needed to expand and bought both Wickham Terrace buildings in 1946. Both buildings were extensively refurbished after purchase and prior to the official opening of the new facilities of the club. The next photograph shows the official opening ceremony being performed by the club's president on 18 November 1946. The picture below shows the Montpelier building dressed up with some bling and lit up for the 1954 royal visit. These days the club has widened the eligibility for membership and boasts almost 2500 male and female members. The buildings are heritage listed and are a valuable part of the Spring Hill street-scape. Oh! A building I've finally been in. My father-in-law is a member and we've had dinner in the room where the rotunda verandah comes off. Beautiful building. The Green House is a beautiful building! Would love to contact you about a photo I have (purportedly of a United Service Club property) but can't get through to you via your emails forms. Are you able to put your actual email address on your page as the proforma only works with a certain email client. I don't understand the problem. It is my actual email address. Just copy and paste to your email client address box.